H. L. Seneviratne is an associate professor of Anthropology, at the University of Virginia. He has also authored "Rituals of Kandyan State". This book encompasses a study in the modern history and sociology of the Sinhalese Sangha in Sri Lanka and its effect on Buddhism in our country. He makes use of previously untranslated Sinhalese sources and extensive interviews with monks. The author unravels the inner workings of the New Buddhism and the ideology on which it is based. He begins with Anagarika Dharmapalas new version of Buddhism in which he called for monks to take on a more active role in social services to the community. He shows how the monks have gradually revised their role to include involvement in the political and economic spheres. The altruistic, virtuous monks of Dharmapalas dreams have now become self centered, arrogant, concealing self aggrandisement behind a facade of social service. Prof. Seneviratnes work constitutes extraordinary scholarship, traditional yet bold and critical. His criticisms are bold, lucid and comprehensive. However the chauvinists of the Sinhala only bandwagon are not likely to take to it kindly. Dr. Seneviratne traces how a religion devoted to compassion and social harmony could turn into a ideology encompassing intolerance and zenophobia. His studies reveal a transition of the Sinhalese Sangha from a monastic community of renunciates who devoted their life to studying the Dhamma, teaching it and preaching it, and catering to the spiritual welfare of the Buddhist by the maintenance of temples and pirivens. They were disciplined by the vinaya rules and the practice of meditation. The professor traces the evolution of the Sinhalese Sangha from these traditional roles, to social services and to politics as advocated by Rev. Walpola Rahula in his revolutionary thesis called "The Bhikkus Heritage" which was published when he was a Marxist firebrand of the Sama Samaja Party. During the penultimate stage of the colonial era of Sri Lanka, the Buddhist monks were an aggrieved party by the neglect of Buddhism by the British rulers and the patronage offered to Christian missionaries. Therefore they yearned for the lost independence where the king was the patron of Buddhism and its ministers. The Marxists cashed in on these grievances and sought to rope in the Buddhist monks to spread their Marxism and its revolution which would usher in Socialism and the elimination of unemployment and poverty. They organised classes in Marxism at the Vidyalankara Pirivena, Kelaniya. As a result the cream of its intelligentsia became Marxist sympathisers. Under these circumstances their budding intellectual Rev. W. Rahula wrote and published his "Heritage of the Bhikkhu". In it he advocated the politicisation of the Sangha and that the role of Buddhist monk should be to take to social services which to him was to take to propaganda and social services that would pave the way for the Marxist revolution which they longed for and expected shortly. This book became very popular with young monks and acted like a tonic on them. Rev. Rahula showed instances from our history where monks have been king-makers, advisors to rulers, and arbitrators in disputes to the throne among Princes. He carefully avoided the instances where monks had supported rebels, and worked against kings and got severely punished, executed, exiled, and their monasteries burnt. During the time of Rajasinha I the chief monks of Sitawaka and Kandy helped their relations to ferment rebellion to thwart Rajasinhas siege of Colombo, to expel the Portuguese and win back Sinhalese independence. Rajasinha was furious and had them executed mercilessly. King Kirti Sri Rajasinha punished monks who helped the conspirators who planned to kill him in the Malwatte Temple at Kandy. Sri Wickrema Rajasinha executed Paranatala Thero found guilty of treason. The hierarchy at Kandy acted in concert with their relations  the Kandyan chiefs who betrayed Sri Wickrema Rajasinha to British imperialists. Therefore the "guardian angles" of the nation and the faith have acted treacherously and disloyally against our last king. Later when they tried rebellion against the British they got their deserts by way of public executions, whippings and deportation, along with the archtraitor Ehelepola. So the heritage cited by Rev. Rahula was a heritage that was disastrous to the Sangha. It contravened Buddhas admonition to the Sangha "Obey the laws of the land  do not go against the kings" (Rajanan anuvattitabbam). In reply to the politicisation of the Sangha advocated by Walpola Rahula, Rev. Henpitagedera Gnanawasa wrote his "what is the Bhikkhus Heritage?" Therein he pointed out the legitimate duties of a monk for which he should dedicate his life. These included studying, teaching, preaching, advising the laity in social service and meditation in terms of the Noble Eighfold Path. Any right-minded person who knows his Buddhism would agree with this. In fact the Buddhist Commission of 1956 which included the most learned and respected Prelates of the day declared party politics out of bounds for Buddhist monks. Mr. Bandaranaike promised to implement the recommendations. Before he could do so he was assassinated by Rev. Somarama under directions from Rev. Buddharakkita. Ever since then the recommendations of the Buddhist Commission are hanging fire for the last 50 years. In the meantime Sangha-politics have gone forward by leaps and bounds. Now we have a Buddhist monk as an MP representing the LSSP at public receptions given to him in his temple at Baddegama and elsewhere. Some Sangha-Prelates have praised and felicitated him. Others more responsible and loyal to the Dhamma-Vinaya of the Buddha have deplored and condemned him. 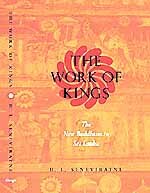 This book is a study to the modern Sinhalese Sangha. It is a major contribution to the literature on contemporary Buddhism. It will interest all students of Buddhism in modern Sri Lanka. Now that a Presidential Commission is looking into the apostasis, malpractices and corruptions that have gained ground during the colonial rule of three Christian European powers is in session it would be most beneficial that they take into consideration the findings of Professor Seneviratnes work and take steps to eliminate politicisation of the Sangha and its attendant zenophobia and the whole train of apostasies that bedevil the Sasana. There are 8 pages containing 15 photographs. They include Rev. W. Rahula addressing a meeting convened to condemn the Devolution Package for sharing power with the minorities. Another depicts Rev. Parawahera Pannananda public, burning a copy of the Devolution proposalsly, monks unloading provisions for the army fighting the LTTE, others depict young monks in political demonstrations. 1. Buddhism, Civil Society and the Present Study. 2. Dharmapala and the Definition of the monks mission. 3. The Economic Stage: Vidyodaya and Rural Development. 4. Vidyalankara: The Descent into Ideology. 5. Social Service: The anatomy of a vocation. 6. The Critique of the Monkhood. 7. Conclusion: From Regeneration to Degeneration. One can read in these chapters the metamorphosis of the Sinhalese Sangha from world renunciates threading the Eightfold Path to Nirvana to standard bearers and cats paws to the glorious pipedream of the new world order under Marxist Socialism. Indeed the failed Marxist Revolution was planned and executed at the Sangarama of the Kelaniya University. The Bhikkus Heritage in action caused the death of many thousands of young Buddhist monks for their role in the glorious revolutions of 1971 and 1989. It ruined the economy and put us 10 years back to a poverty-stricken third world backward country, saddled with a civil war for a separate state  thanks to the "guardian angles" led by Ven. Baddegama Vimalawansa who forced Bandaranaike to tear up the B-C pact.